It all starts with a quick, 5-step, checklist… then our experts do the rest for you! The first step is to tell us how long you need your temporary rental for. MYTAS properties are available for UK rentals of six months or more. If you wanted to rent for 9 months or 24 months, then we give you a fixed price for the duration you require, irrespective of possible rent or utility increases. If you’re looking for less than six months, or perhaps a more permanent solution, then our sister company HCR can help, with serviced accommodation using the revolutionary ReloQuest™ bidding platform. Then we ask where you need the property to be. You can have a MYTAS property wherever you want in the UK (providing there are rental properties available). No standard lists or restrictions on locations here: we vet and select properties from the local private rental sector in the area you specify, giving you the ability to place your people exactly where you need them to be. How much and what type of space are you looking for? We go further than just the number of bedrooms or bathrooms… perhaps your employees would like a garden… or maybe they can’t think of anything worse! Would a ‘bachelor pad’ fit the bill, or are we looking for a family home? By using the private rental sector, we source the right properties for each individual accommodation, so you aren’t left managing complaints from disappointed and unhappy employees. Budgeting is easier with MYTAS. We work to your stipulated budget; we provide a firm quotation for a fixed monthly fee; and we guarantee we’ll stick to that cost. Our fee includes everything you and your occupants need: from pre-vetting with your duty of care in mind, through to move-out and beyond, including tenancy agreements, rent, utility connections – even utility bills – and much more: no hidden extras or nasty surprises, so you can be sure you’ll always be within the agreed budget cost. To discover exactly what’s included, check-out our checklist here. 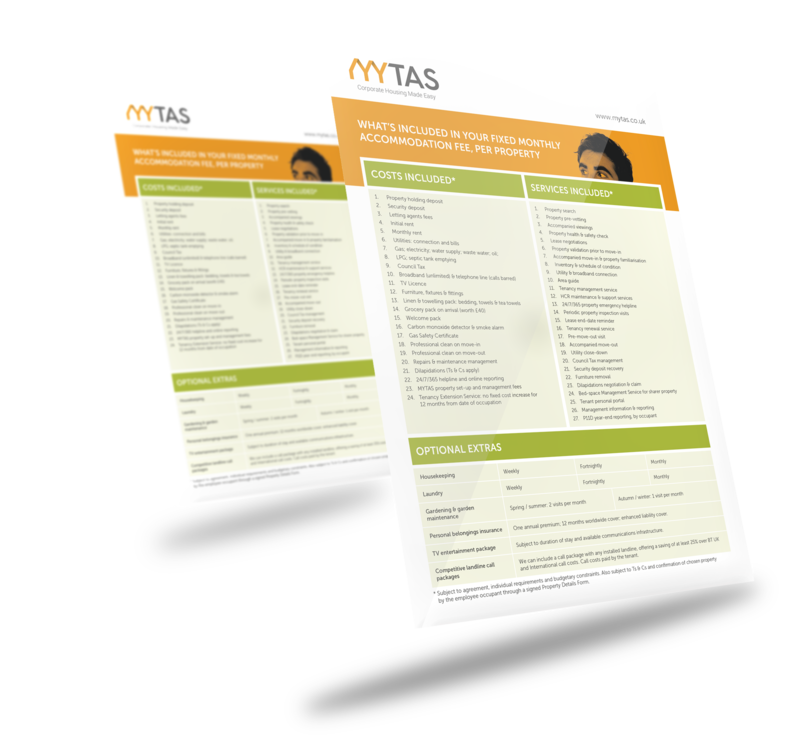 In addition to the standard service, MYTAS offers a range of in-tenancy ‘extras’ you can add to any tenancy contract. Covering services such as housekeeping, gardening and laundry, they’re here to make your occupant’s life easier, so they can concentrate on the day job. In some circumstances, these options can help mitigate end-of-tenancy service costs too. Based on your information, we’ll give you an ‘estimate of the likely fixed cost’… and if you give us the ‘go-ahead’, we guarantee our final quotation, based on the chosen property, will be within plus or minus 10% of that figure. And we keep you in the loop throughout the tenancy too. Our maintenance portal provides your occupants with real-time access to a 24/7/365 Maintenance Reporting system, and our Management Portal provides you with financial details and property inspection reports. Above all, MYTAS is designed to save you time and money. Whilst we’re sorting everything, it frees you up to concentrate on other work. No negotiating with landlords, no ‘messing about’ with utilities, no stress… simply leave all the ‘hassle’ to us!